Alle Preise in US Dllars sind pro Zimmer ( Einzel-oder Twinzimmer). Hong Ngoc - Viet Tri Hotel liegt im Zentrum von Viet Tri - Phu Tho Stadt in a convenient, airy and large campus as well as an elevator system and modern equipment. 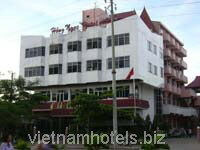 Hong Ngoc - Viet Tri Hotel has 26 rooms and specializing to serve congresses, welding parties, festivals required. The hotel still has services such as Karaoke, Massages, taxi, Sports, (tabletennis, billards), bookings, ect. Coming to Hong Ngoc ensures that you will be satisfied by conveniences and whole-heartedness and thoroughness from Hotel's staffs.